This is the story of the Associated Society of Locomotive Engineers and Firemen (ASLEF). When the Great Western Railway restructured pay scales in October 1879, its longest-serving drivers and firemen found their wages cut and their working hours extended. Thomas G Sunter, ASLEF general secretary from 1889 to 1901. Faced with this intransigence, enginemen Charles Perry, Evan Evans, Tom Harding, Tom Roderick and others spent the next two months contacting their colleagues in Sheffield, Bristol , Pontypool, Newport and Birmingham . By February 1880, the first eight branches of the newly formed Associated Society of Locomotive Engineers and Firemen had been formed and the union was on its way. Within a year, ASLEF had established a central executive – based for convenience on the Leeds branch – and had registered under the Trade Union Acts, its head office being the Commercial Inn, Sweet Street , Holbeck, Leeds . Its first general secretary – on a salary of £2 a week, was Joseph Brooke, while George Rushworth received 30 shillings for his assistance. By 1884, membership had exceeded 1,000. Although the union continued to grow in membership and wealth, it enjoyed little success in fighting for its members’ terms and conditions during the early years of its existence, with a number of small disputes ending in defeat. With most engineers and firemen still outside the union, it simply lacked the clout it needed to threaten or deliver a halt to work. Despite this, by 1904, when the union had 12,000 members and £123,000 in the bank, train drivers and firemen had mostly achieved a ten-hour day everywhere except Scotland and Ireland , where shifts of 12 hours remained common. But wages were low – again, particularly in Scotland – and few railway companies offered paid holidays, with the most generous restricting them to three or four days a year. The most significant early dispute involving ASLEF came in 1911, when at the peak of a year of industrial unrest that had already brought seamen, dockers and others out on strike, railway workers walked out in pursuit of better pay. In one incident at Llanelli in South Wales , troops called in to restore order shot dead two men after pickets halted trains entering and leaving the town. Membership continued to rise rapidly, standing at 57,000 by 1919, but ASLEF, then as now, resisted all entreaties for it to merge with the still larger ASRS – today’s RMT. Forty years of contraction in the rail industry following the Beeching Report has seen membership of ASLEF fall back, but by 2015, the union still had nearly 20,000 members. 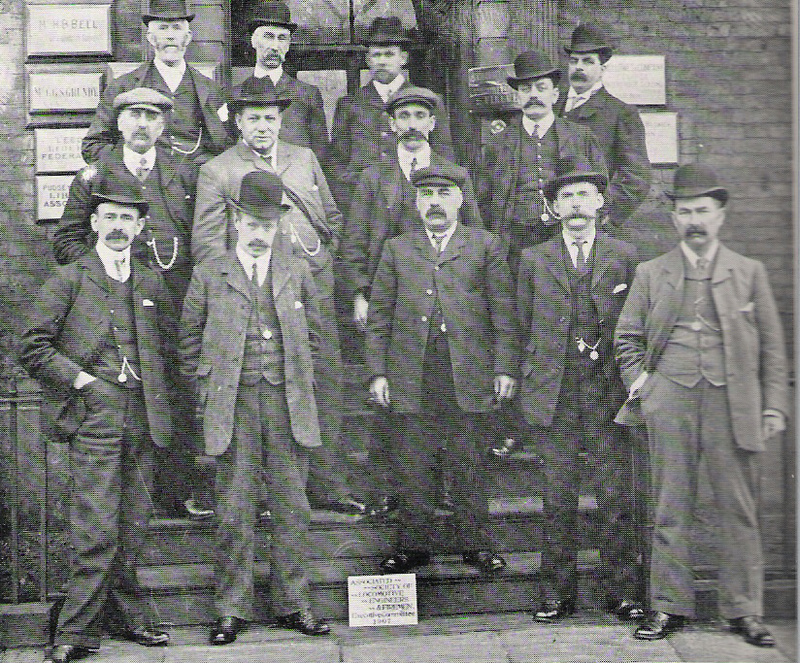 Members of the ASLEF national executive in 1907. The following extract is from The Lighted Flame: A History of the Associated Society of Locomotive Engineers and Firemen, by Norman McKillop (Thomas Nelson and Sons, 1950), and gives brief biographies of ASLEF’s head office heads of department and national executive. Mr Norman Bell, Office Manager: entered the Society’s service in 1913 as junior clerk. He has a wide experience in various departments. Mr Bell was given charge of the Movements Department on its inauguration in the early twenties. He developed the department from scratch and conducted it with efficiency; and in 1944, on the retirement of Mr Albert Wintle, was appointed to the Office Managership. He has an encyclopedic memory, and is a mine of information on all matters connected with Society administration. Mr Leonard Palmer, Movements Department : has had a wide experience in various departments since joining the service in 1921. In 1944 he took over charge of the Movements Department from Mr Bell on the appointment of the latter to the Office Managership. Mr Palmer combines ability, knowledge and thoroughness in the execution of his duties. Mr J. Marvill, Secretarial Department : joined the service in 1919 as a junior clerk. He has wide experience of the working of several departments. Mr Marvill was appointed to take charge of the Secretarial Department when it was set up to carry out in a co-ordinated manner the various secretarial services of Head Office to the General Secretary and the Executive Committee. Mr S. R. V. Blackmore, Legal Department : joined the service in 1921, and has experience in various departments. His present department handles, under the general supervision of the Acting Assistant General Secretary, correspondence in connection with the multifarious individual cases dealt with by Head Office on behalf of our members, arising from legal matters of many kinds, as well as industrial injury claims. Mr C. S. ( Stanley ) Rhodes, Cashier : has been in the Society’s service since 1920. He was appointed Cashier in April 1948, on the retirement of Mr William Parker. Mr Rhodes had previously been for many years in charge of the Returns Department. Mr L. Maude, Returns Department : joined the service in 1920. He has a sound general knowledge of Head Office work, and was appointed this year to his present department, which is responsible for the checking of branch returns, the recording of contribution income, and the maintaining of individual membership records. Mr Charles Thompson, Voluntary Sick Department : joined the service in 1921. He was a member of the Returns Department staff until appointed to take charge of his present department on the death of Mr Albert Fox, junior. Mr Thompson deals with the issue and recording of all sickness benefit payments. Messrs Bell, Marvill, Rhodes, Maude and Thompson are all Yorkshiremen who migrated south with Head Office in October 1921. British Locomotivemen have possibly the most efficient and smooth-running negotiating machinery that exists in industry. Notwithstanding the many complaints we are not slow in voicing, the instrument we have fashioned over the years is admitted to be a model, and a compliment to the long-sighted sagacity of successive generations of our representatives. It will not be out of place to record briefly here how it functions, and to indicate some of the personalities who are assisting to run the machine. The governing body of our Society is the Executive Committee, all of them working Locomotivemen, each with years of practical locomotive service, a wealth of trade union knowledge and an immense background of experience in negotiations. They are elected for a term of 3 years, after which they can stand for re-election. Up to 1948 the Executive Committee member, after serving his second term, was not eligible for re-election until a period of 3 years had elapsed, but this is now altered and the number increased from 9 to 10 members, 1 of whom must be an Electric Motorman (Surface), and 1 a Motorman member of the London Transport Executive. All of our Permanent Officers work under the instructions from the Executive Committee, who in turn are instructed in main items of policy by the whole rank and file of the Society via the medium of our Annual Assembly of Delegates, which is representative of every branch in the organisation. We thus ensure that our Society is truly democratic in its function. For the purpose of conducting the business of the Society, the Executive Committee meets once a quarter, unless required to deal with some urgent matter, whereupon a meeting is summoned jointly by the President and the General Secretary. President, Mr P. McGubbin : born in Glasgow , and started to train as a lawyer, but forsook the law to drive railway engines. Peter is still influenced by that early training; at least it has come out in his super-efficient administrative work on the District Councils and the Executive Committee. He is a master of constructive analysis. Vice-President, Mr J. Lawrence : from the L.M.S. at Birmingham–imperturbable and sincere. It is indicative of how much he is appreciated that he has just been re-elected for his second term of office. Mr F. Handsley : the ‘Electric’ representative on the Executive Committee. Now in his second term of office. He knows all the answers, and is efficient and genial. Mr F. Kelland : from the G.W. at Laira. Forthright and a grand speaker, he was elected Chairman of the 1947 Annual Assembly of Delegates. Mr J. E. Roberts : Jack is a Town Councillor in his home town of Carnforth . From the L. M.S. Genial but not afraid to express an alternative opinion on the Executive Committee. M W.York . Billy York is one of our best-known Locomotivemen. First prominent in Immingham, but transferred on promotion to Bourne; L.N.E.R. Chairman of the L.N.E.R. Sectional Council before coming to the Executive Committee. Mr A. Brown : from the L.M.S., Leeds . A newcomer to the Executive Committee, with a great tradition to live up to–Leeds was the first home of our Society. Mr J. L. Simons : from the G.E. section of the L.N.E.R., Norwich . Jack Simons is a real team-worker, not only able to state his own point of view, but-an invaluable trait-prepared to sink his opinions for the benefit of the majority. Mr R. G. Pavey : came in place of Ted Bidwell, a former President of the Society. He is from the S.R., and is, along with J. Simons, the latest to be elected to the Executive Committee. He came with a well-deserved reputation for efficiency, from the Southern Sectional Council. Mr J. F. Bradley : senior Trustee. Member of Bricklayers Arms Branch. Joined Society on 1st July 1910. Was Secretary of the above Branch from 1913 to 1919. From the S.R. Elected Trustee in 1929. Mr R. E. Nutting : joined Society on 28th September 1913. Member of King’s Cross Branch. From the Eastern Region. Elected Trustee in 1939. Mr W. J. Hayward : joined Society on 1st August 1923. Member of Willesden Branch. From the L. M.R. Secretary of Branch 1935. Elected Trustee 1945. The senior Trustee must always be present when financial matters are discussed during the Executive Committee sessions. 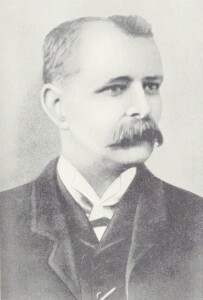 Mr H. C. Gardiner: from Bolton. Harry is genial, looks easy-going–until he gets among these terrific ledgers, and then becomes almost machine-like in his thoroughness. He served an apprenticeship of 13 years as a branch secretary. Mr Anderson Hart: immaculate and precise. From the L.N.E.R. at Parkhead, Glasgow. If his engine driving is like his auditing, it will be precision running of the highest order. Mr A. A. Exworth: recently elected in place of Mr J. Soundy, our senior Auditor, who retired this year on reaching .the age-limit. Express driver from Doncaster. Branch secretary for 20 years. Seems to revel in these masses of figures. The Lighted Flame: A History of the Associated Society of Locomotive Engineers and Firemen , by Norman McKillop (Thomas Nelson and Sons Ltd, 1950).